This brings you a whole new experience in the world of shoot 'em ups. Step into the world of Troy, a simple mechanic with a small garage which is destroyed by the Titan corporation in their unstoppable, steamrolling expansion. You'll start your journey with an old jet that Troy has lying around in his garage. Set out to shoot your way through different areas in order to collect more scrap and loot to improve your ship to bring the Titan corporation to its knees. How will you build your ship? Will you go for high damage? Targeting lasers? Or an army of drones? It's all up to you. The upgrading and modification system is detailed and endless, giving you the freedom to customize your weapons the way you desire. Start shooting, collecting and upgrading to help Troy in his quest to free the world from Titan's tyranny. 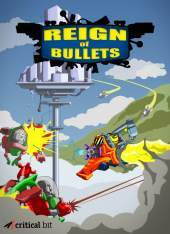 2D shoot 'em up gameplay with waves of enemies and screen filling bosses. Lots of upgrading possibilities on each and every individual gun leading to a nearly endless amount of variations to customize your weapons to suit your playstyle. Guns are based on different types ranging from simple rifles to drone launchers. A simple rifle can be modified to a shotgun, minigun or sniper rifle. Free weapon placement: Place weapons anywhere on your ship in any direction to adapt to different enemies and levels. Epic loot: Defeat bosses for rare and epic weapons that upgrade your ship to take on new areas. Campaign mode: Play through the storyline that leads you through all the different areas and tells the story of Troy and his crusade against the Titan corporation. Survival mode: Play each area in survival mode with randomly generated levels for nearly infinite replayability. What is the highest level you can reach?